Most Americans have vaguely heard of the Passaic River and may associate it with New Jersey, but inhabitants of northern New Jersey have been attracted to it for more than 350 years, preceding English settlement of the area. Intrigue with the river's history dates to the earliest Dutch origins. As a basic prerequisite for life, the river provides refreshment. It also was our first dependable means of transportation. But Newarkers and nearby residents have used it for other reasons as well. Besides drinking from it, floating on it, or moving freight and passengers by sail and steam, we swam in it, rowed on it, held regattas on it, traveled on it by steamboat to New York City on business and to Coney Island on pleasure. Unfortunately, we also polluted it beyond belief with the coming of the Industrial Revolution and the explosion of manufacturing activities. We dumped raw sewage into it at Newark, Paterson and Passaic as well as from dozens of smaller communities hugging its waterline. To our credit, we have tried to clean it up on several occasions in this century. We began to build sewage treatment plants, cut down on illegal dumping along its banks and conduct studies on how to reclaim it for the present and future. And we are trying to reincorporate it into plans for the city's renaissance. On other level, the river that helped give birth to Newark nearly 333 years ago can play a major role in the region's revitalization, similar to that wielded by Trinity River in San Antonio, the Harbor at Baltimore, or Alleghany and Monongahela rivers in the new Pittsburgh. Already, great green lawns have appeared on the banks at the site of Marcus Ward's old veterans hospital across from the New Jersey Performing Arts Center. A panorama of Newark has been created along Raymond Boulevard in the Ironbound. Plans are now being laid for a park to extend from the Clay Street Bridge, following the river past NJPAC, passing underneath the massive rail complex at Pennsylvania station, and moving on to the East Ward and the recently saved and soon-to-be-renovated Riverbank Park. Who knows? Maybe the river that originally gave birth to Newark with the arrival of Elizabeth Swain in 1666 can act as some sort of mortar which holds together yet another city to be called the new Newark. Next up the river was George Holden's slaughterhouse near the Ballantine malthouse. The Holden dock was used for fishing. At the bend of the river there was a spring that surfaced at low tide near the Citizen's Gas Co. Nearby was the Chadwick Patent Leather factory, and adjoining it was the Lime and Cement Co. Already industrial encroachment into the once pure waterway had begun to take its toll, and within two to three decades a pristine Passaic had turned most foul. While the downtown segment of the river was already giving way to industrial excesses and gross over-development, the upper portion remained relatively pure until the 1890s. The Old Point House, a some-time country tavern and inn was headquarters for fishermen, vagabonds and others, and was located near Mt. Pleasant Cemetery. Green Island, now disappeared, was somewhat a bulwark of unsullied forested island in a waterland of a dozen types of fish including smelts, shad, bass and sturgeon. In addition, the island was noted as a rendezvous of wild ducks and geese and was indeed a hunter's paradise. It lay just across from the cemetery and 'the Cedars' home of Frank Forester. In fact, Green Island at one time belonged to Mt. Pleasant Cemetery, but the extension of the Erie Railroad along the Newark/Paterson branch resulted in the ruin of the old nature storehouse as railroad tracks ran through the center of the area and separated the burial ground from the river. Railroad encroachment here and in other areas was beginning to signal the decline of the area and the disappearance of many of the comfortable estates that dotted the river's banks. So by the century's end, the railroads were chewing up the countryside and industrial pollution was beginning to foul both the air and water. The Passaic River at or near Newark was a place where steamboat history was made. 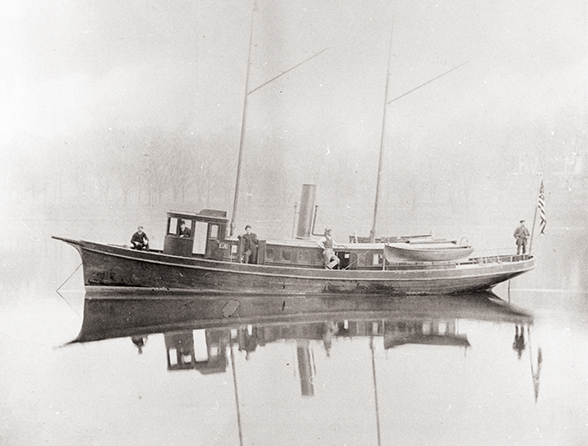 As early as October 1792, Nicholas Roosevelt, an ancestor of President Franklin Roosevelt, demonstrated the steam craft that he had constructed. It was his 60 foot-long ship, with a 20-inch cylinder engine, with a 2-foot stroke that was capable of reaching speeds of 3 miles an hour. A last-minute engine failure resulted in his ridicule. However, the stage had already been set for travel history by the steamer Polacca, and a new era was about to emerge. In 1807, Roosevelt collaborated with Robert Fulton in his successful Hudson River demonstration with the Clermont. By 1836, regular steamboat service was established between Newark and New York City. For the next two years the Newark sailed on schedule and after it burned it was replaced by the Passaic. At the same time, Sunday excursions to Coney Island proved immensely popular with the working classes in spite of criticism leveled at them by church supporters. But friends insisted that the trips would 'give mechanics and others whose vocation during the week would not allow for the luxury of enjoying the sea breezes and a dip in the ocean.' By the time of the Civil War steamboat service had become a common form of transportation. For almost three decades the Passaic River was the center for rowing clubs, roughly from the end of the Civil War until the last decade in the 19th century. The first club, the Passaic Boat Club, was formed in 1865. Others include the Nereid, Eureka, Triton, Atlantis and Ariel, Woodside, Essex, Mystic, Institute Boat Club and Anneke Jans Club. Their strict membership rules dictated uniforms, club pennants and expansive entertainment. Regattas and races were usually held on Memorial Day and the Fourth of July. A typical event lasted from 8:30 a.m. until 6:30 p.m. and included a grandstand seat in the wooden bleachers located near the Erie Railroad Bridge, a stadium that seated 5,000 spectators. The races ran for a mile from the Erie Bridge to the Greenwood Lake Line, and members of the individual crews were as widely known then as football or baseball stars today. The crew of the Eureka Four was especially well known and some crew members actually made it to the Henley Regatta in England. The Amusement News and Weekly Record of Newark noted in March 1907, 'Loyal yachtsmen are busy these days with their craft getting in readiness for the coming season. Along the river front, scores of boat owners are to be seen scraping, caulking, painting and repairing their boats for the joyful days to come. It is expected that this will be one of the biggest seasons for the boatmen Newark has ever seen.' But this happy season of sport was not to continue, for as Newark became more prosperous, its pollution became increasingly unacceptable. Frankly put, industrialization and pollution put an end to an era, and no regattas were held from 1902 until 1925. The institute (club) tried to lead a revival but failed, and only the Nutley and Belleville high school crews braved the foulness of river pollution in the 1960s. After 69 years of racing, the institute's red and blue banner fluttered over its old Chester Avenue boathouse for the last time. Its barge was purchased by the Knights of Columbus to be relocated at their summer camp at Culver's Lake. Racing shells and gigs that once were valued at $500 and $800 apiece were sold to individuals for $15, and the old boathouse was knocked down for the building of Route 21. The property was sold, title passed, and the mostly Irish descendants, former crew members, stood one last time to sing 'Should Auld Acquaintance be Forgot.' Newark's industrial success ended the use of the Passaic for recreation and potable water and earned for the river a reputation as one of the nation's most fouled waterways. Too much was being expected of the once sweet stream by too many people and the whole system broke down. A near open sewer of industrial and human waste rotted the racing shells that occasionally skimmed its surface. By the 1930s the Passaic had become 100 percent salt water and heavy industrial use of it as a waterway was in full swing. Scrap iron was being exported overseas and imports included potentially messy products such as fuel oil, gypsum, coal and tar, plaster rock as well as some steel from Europe and England, wool from South America, and cotton from Egypt. Occasional spills of crude oil, tar and coal were especially damaging to the remaining fish life. But most crucial of all was perhaps the public opinion about the waterway. Abandoned buses, rotting ship hulls and just discarded industrial scrap of all sorts was quietly slipped into its watery arms knowing there would be little if no protest. A 1946 report by consulting engineer Lee T. Purchell Paterson noted that 'it was a beautiful river with few inhabitants until today, the early uses for potable water supply, industrial water supply, transportation and recreational activities have become so affected that most of these uses are lost to industries and communities…the river has lost most of its economic value. The only solution for its possible rebirth was the removal of all sunken hulks, junk yards and rubbish heaps along its band, and the establishment of parks and recreational facilities whenever possible.' Fifty years later the Passaic's rebirth seems more than just a dream with the proposed Joseph G. Minish River Park now on the drawing boards and federal tax money being generated through congressional support. A whole new era could and should emerge if this dream becomes a reality and becomes a powerful helpmate and handmaiden of a renaissance city and region.